1930 – The land that makes up the park was bought from the Lord of the Manor. 1941 – The site is used by Ready Mix Concrete (RMC) to excavate gravel. 1970 – RMC start to plan what they will do with the site when the excavating work finishes. They decide they will use the site as an example of how they can re-claim the land by opening a leisure visitor attraction. 1971 – RMC form a subsidiary company called ‘Leisure Sport Limited’ to run their attraction based on “The history of the British people as a maritime nation”. 1975 – The World Water Ski Championships are held at the site. 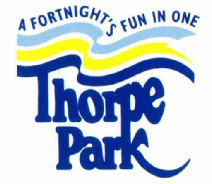 1979 – On 24th of May 1979 Thorpe Park was officially opened to the public by the late Lord Louis Mountbatten. Attractions at the water based pack included: The Mountbatten Pavilion (later Port Atlantis/ the Dome), Model World, A WWI Aircraft Display and the Schneider Trophy Aircraft Exhibition. 1980 – Waterbus trips and Windsurfing begin at the park. 1981 – Cinema 180, a UK 1st opens. 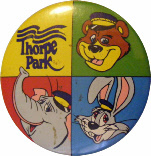 1982 – Magic Mill and Thorpe Farm open this year. 1983 – Phantom Fantasia and Treasure Ireland Railway open. 1984 – Space Station Zero opens. 1985 – Cap’n Andy’s Revue opens. 1986 – Teacup Twisters opens. 1987 – Costing over £2 million Thunder River and the new park area ‘European Square’ open. 1988 – Palladium Theatre, a 630 seat theatre opens. 1989 – Canada Creek, a new area of the park opens containing Loggers Leap (Britain’s Highest Log Flume), Canada Creek Railway and the re-located Rocky Express. 1990 – Space Station Zero is re-located outside in Model World and re-themed as the Flying Fish. This year also saw Carousel Kingdom, Trappers Trail and Drive in the Country open. The Thorpe Park Rangers Show also began this year. 1991 – Fantasy Reef, a new park area opens with the new ride Depth Charge, the UK’s 1st four lane waterslide. 1992 – Hudson River Rafters and Viking Rowers open. The Children’s ride area is re-developed as Octopus Garden. 1993 – Calgary Stampede and Virtual Reality Centre open. Treasure Island Railway closes. 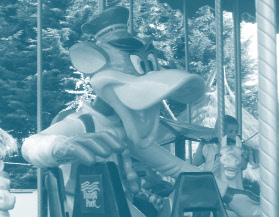 1994 – Rangers County, home of the Thorpe Park Rangers opens with two new rides: Chief Ranger’s Carousel and Mr Monkey’s Banana Ride. Phantom Fantasia is re-themed as Wicked Witches Haunt and Jungle Zone, Family Golf opens. 1995 – Drive in the Country is moved to Rangers County and re-themed as Miss Hippo’s Fungle Safari. Also Magic Mill becomes Mr Rabbit’s Tropical Travels. 1996 – X:\ No Way Out, the Worlds 1st pitch black backwards rollercoaster opens and is one of the largest investments RMC spend on the park. 1997 – Hudson Rivers Rafters close. 1998 – Dare Devil Drivers, Dino Boats and Wet Wet Wet open. RMC sell Thorpe Park to the Tussauds Group. 1999 – Pirates 4D, the UK’s 1st 4D experience opens. Viking Rowers and Carousel Kingdom close. 2000 – Tidal Wave opens, at the time it was Europe’s tallest water ride. Fantasy Reef becomes Neptune’s Kingdom. Then on Friday 21st July 2000 disaster strikes at the park as the ride building for both Mr Rabbit’s Tropical Travels and Wicked Witches Haunt is destroyed in a fire at the park. Jungle Zone Family Golf, Dare Devil Drivers, Cap’n Andy’s Revue, Dino Boats and Trappers Trail all leave the park. 2001 – Detonator, Vortex and Zodiac open. 2002 – Colossus, the Worlds 1st ten looping coaster opens. Thunder River becomes Ribena Rumba Rapids. And Fright Nights begin at the park. 2003 – Nemesis Inferno, Eclipse and Quantum open. Calgary Stampede closes. Teacup. Waterbus trips at the park end as the Flying Fish and Model World close. 2005 – Slammer and Rush open. 2006 – Launch coaster Stealth opens and Thorpe Farm closes. 2007 – Merlin Entertainments Group buy the Tussauds Group including Thorpe Park. 2007 also saw the return of the Flying Fish. Pirates 4D closes. 2008 – Time Voyagers 4D opens. 2009 – Saw – The Ride opens. Miss Hippo’s Fungle Safari closes. 2010 – Year round horror maze Saw Alive opens. Octopus Garden, the Children’s ride area closes. 2011 - Storm Surge opens.